2. Grab a sharp knife and cut a pocket into each of your chicken breasts. Fill each chicken breast pocket with 1/4 of the blue cheese. 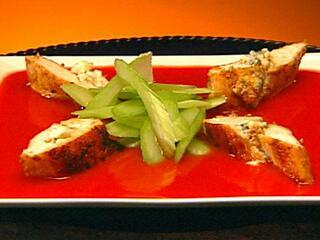 Secure the opening of your chicken breast with a toothpick so that your blue cheese doesn't spill out. Afterward, season with your desired amount of salt and pepper. Once you have your chicken prepped, heat your oil in a nonstick, oven-friendly skillet over medium heat. Sear your chicken breasts on both sides until they've reached a golden brown hue (3-4 minutes). Finish your chicken breasts off in the oven for about 8-10 minutes. 3. Now you can grab a small pot to make your sauce. Add the butter, hot sauce, and white vinegar in the pot and cook it over medium heat until it begins to bubble. Once bubbling, pour half of the sauce over your chicken breasts and cook them over medium heat for about a minute. You can add extra sauce once you plate them. The wing version of this Buffalo favorite is often served with a side of celery or carrot sticks to cool your fiery palate. Plate your buffalo breast with a fresh and crunchy salad. Whether you're watching a football game, your favorite television show or movie, your spicy stuffed chicken breasts will undoubtedly enhance any experience.